Good morning, dear tea friends! 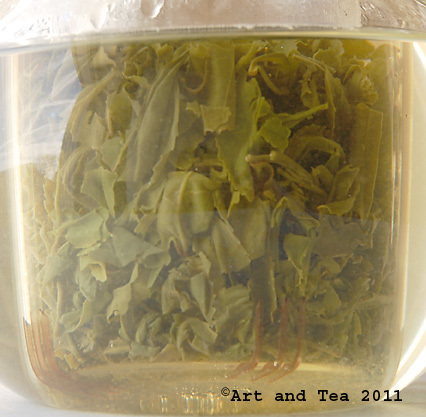 This morning I’ve brewed up a pot of another green tea, this one from Korea called Jung-Jak. 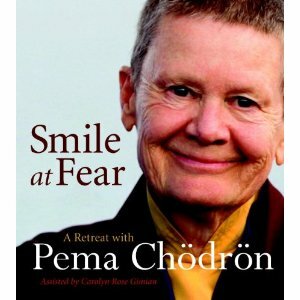 Interestingly enough, I did review the 2008 version of this tea here. This spring harvest tea is usually plucked sometime during the month of May. Its name translates to “medium sparrow tongue”, a colorful reference to the appearance and shape of the leaf. I’ve been looking for a comparable alternative to our Japanese teas as my company decided to take a cautious stance and not purchase any 2011 teas from Japan. 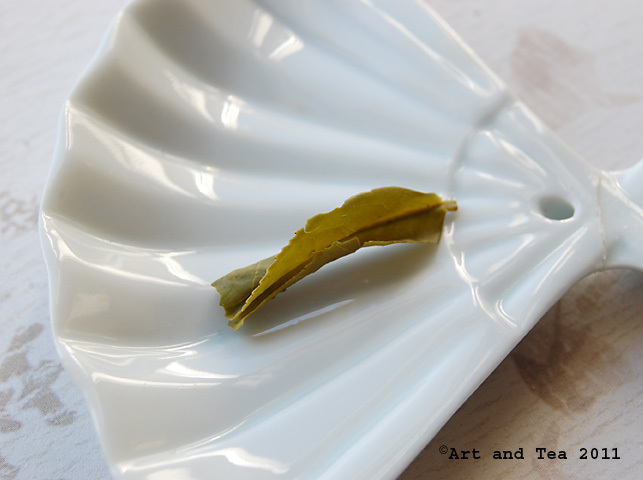 I steeped the leaf for 3 minutes in 180 F water. I noticed that I used 160 F water back in 2008. I think that I’ll steep another pot using that temp as, right away, I taste a bit of a tang on my tongue. 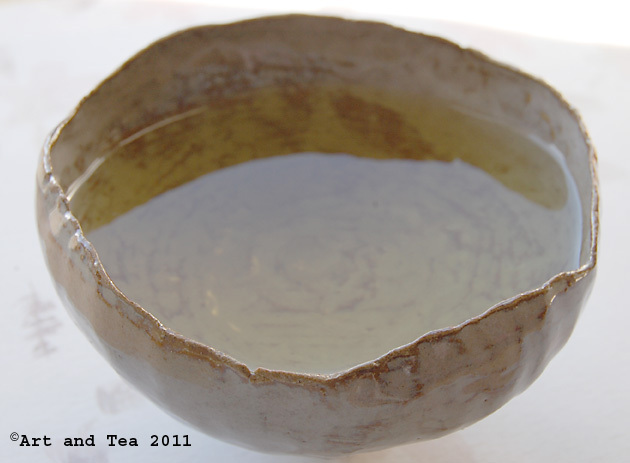 Have you ever had a cup of green tea that you thought was too pungent? More than likely, the water temp was too hot for steeping the leaf. 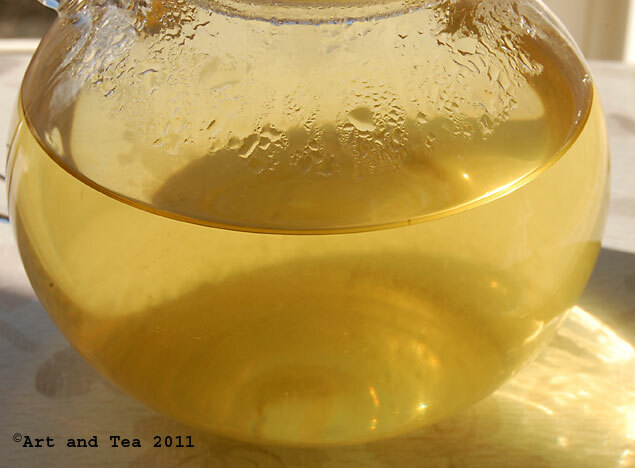 The warm sunlight in the photo above tints the tea liquor golden but it is the color of light jade. The aroma has a pronounced vegetal quality, like fresh spring asparagus, which carries over into its flavor. This tea makes my mouth feel very fresh. I don’t consider myself a green tea connoisseur at all, drinking it probably several times a week. That said, if I didn’t know that this tea came from Korea, I would guess that it’s a Japanese sencha. I’d love to hear your feedback if you’ve tried this tea. Next weekend I’m attending my 35th high school reunion. I’m amazed at that incredible number and am looking forward to seeing my former classmates and hearing about their life journeys since our graduation many moons ago. So, I won’t be reviewing a new tea next Saturday but I’ll be back in 2 weeks to enjoy a cup of tea with you again. 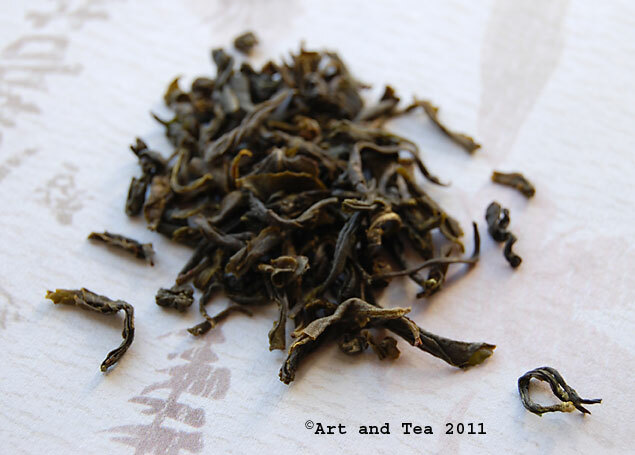 This entry was posted in Green Tea, Photography, Tea and tagged Jung-Jak green tea, Korean green tea, Korean tea, tea review. Have a great reunion and a Happy Thanksgiving, Karen!! I’m quite interested in exploring Korean teas! Karen, your green tea review is timely. I’m getting close to ordering some more tea, one being a new green tea. I still like China green teas the best. Will have to consider this varietal as well. How ironic; my 30th HS reunion is this coming weekend. Have fun at your reunion & a great Thanksgiving. Thanks Judy and Happy Thanksgiving to you and your family! Just a heads up, Amy. This tea is much more vegetal than most China greens so if you like a lighter vegetal flavor to your green tea, my recommendation is to stay with the China greens. Thanks and Happy Thanksgiving to you and Eric!